Okinawan artist Seikichi Tamanaha’s exhibition featuring many of his sculptures and paintings. January 11, at the Okinawa Prefectural Museum & Art Museum in Naha. An exhibition of the work of an Okinawan artist looking into the essence of beauty called “Pioneer of Okinawan modern sculpture, Seikichi Tamanaha Exhibition – traces of sculptures and paintings” is on at the Okinawa Prefectural Museum & Art Museum in Naha from January 11. Sculptures such as Nozomi no zou, or statue of hope, which has been restored by his students, paintings that have been brought back to Okinawa from the United States, and documents such as diaries and letters are currently being exhibited. The exhibition traces the life work of Seikichi Tamanaha (1918-1984), who introduced modern sculpture to Okinawa in the period after Rodin. This is the third exhibition of the Okinawan Art series organized by the Prefectural Museum, following on those of Aijun Nadoyama and Seigi Adania. Tamanaha led the way in the Okinawan art world starting the Nishimui Artists Society near the ruins of Shuri Castle in the immediate postwar period. He left behind a body of monuments such as the relief of the Himeyuri Monument. He is also known as an abstract painter who used the decayed wrecks of boats, lamps, and cinerary urns as a motif. Thanks to the cooperation of Stanley Steinberg, who remained in Okinawa during the U.S. military occupation as a medical officer and learnt the basics of painting from Tamanaha, 15 works of art such as oil paintings have been borrowed from the United States. These rare representational paintings of the Nishimui days can be seen in this exhibition. 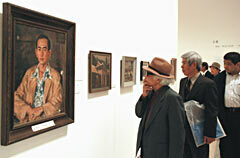 The exhibition runs through until March 11. Admission charge is 800 yen for adults, 500 yen for high school and university students, 300 yen for elementary and junior high school students.